I have known (even now it’s hard to say “I knew”) David Barron since the mid-1970s and was always uplifted by his sheer delight and interest in programming — whatever the paradigm and whatever the language. He always told me that once you’d had the privilege of working with programmers of the calibre of David Wheeler and Christopher Strachey you rapidly got used to discussing everything from assembler level detail (Initial Orders II), to CPL design, to abstract semantics without turning a hair. In the late 70s and early 80s David and I had a lively exchange of views on the rival merits of Algol68 and Pascal. It was typical of David’s status as a Scholar and Textbook Writer that he was soon in at the deep end writing texts (with Judy Bishop) on PASCAL. David and I would certainly have agreed that whether there’s a “heaven up there”, or not, is a classic example of undecidability. But if you *are* up there, David, then please go to the Celestial Electronic Document Vault and pull out, and read, a copy of “Why PASCAL is not my Favorite Programming Language” by Brian Kernighan. I also recall, around the same time, that David wrote a book, with Mike Rees, on UNIX troff. Like me, he delighted in the fact that there is no loop in troff macro syntax and yet there is recursion! So, despite the fact that troff macros seem light years away from a functional language, nevertheless if you want to have a loop in a macro you have to use recursion. Nice one! 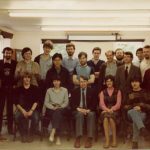 In the 1980s David gave me an enormous amount of advice while I was involved in setting up Computer Science at Nottingham from 1984 onwards (and I should also add that Roger Needham and Frank Sumner were invaluable too). 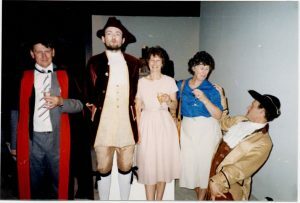 The common heritage of Southampton and Nottingham in giving External London degrees for the first half of the last century meant that much of David’s experience was of very direct help. 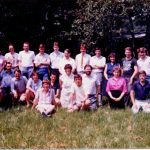 And that in turn led to two decades of Southampton/Nottingham competition and collaboration in various fields of CompSci. From the beginning of the email era in the 1980s David was one of my most valued and frequent email correspondents. The earliest email I have from him goes back to 1988 (and that date would have been earlier still, had a catastrophic disk crash, in the early 1990s, not wiped out much of my archived mail). My `DWB’ mail folder now totals just over 1000 emails over 22 years — not far short of one per week. David acted as External Examiner for us, here at Nottingham, on many occasions and at every level from undergraduate to PhD. Most recently, in 2005, he was PhD external examiner (in 2005) for my lecturer colleague, here at Nottingham, Dr Steve Bagley. ” … this candidate *really* knows his stuff” (!). For the past 10 years or so my face-to-face meetings with David have tended to be at various Cambridge events celebrating “50 years of EDSAC” or in honour of David Wheeler and (most recently) Maurice Wilkes. The last of these, of course, took place only last year. Although David looked very frail he gave a wonderful and affectionate talk about Maurice and the pioneering days of EDSAC (now available online, and as a paper in Computer Journal). Afterwards his delight was evident when he received heartfelt congratulations and thanks from Maurice’s daughter. Finally, it was evident to me from the earliest days that there were almost as many “Davids” in computer science as there were “Bruces” in Australia (as depicted in the Monty Python sketch). As an honorary “fourth David” I was introduced to the disambiguating syntax (used by Drs. Barron Hartley and Wheeler at Cambridge) of saying “David (him), David (you) or David (me) ” to make one’s meaning precise. So, farewell then, David (you). I’m missing you so very much already. From what has already been said this afternoon we have learned what a remarkable academic career David enjoyed. What may not be as widely known is that, in addition to being a distinguished scientist and learned professor, a loving husband and the proudest of fathers, he was a founding member of the SPG, becoming recently its oldest member. The SPG is a strange and mysterious club with no rules that its members understand. Its weekly meetings are solemnly conducted in defiance of the philosopher Wittgenstein’s dictum that whereof one cannot speak, thereof one must remain silent. In the SPG meetings David contributed in the style many of us will recognise, and it was always evident that if he was not actually disgruntled, he was far from being gruntled. It should be mentioned that what David looked for most from SPG meetings was a reasonably faithful simulacrum of that fabulous elixir Buck-u-Uppo, described by his favourite author as a marvellous specific which, when taken with some food, encouraged the elephants of Indian Rajahs to face tigers in the jungle with jaunty sang-froid. A teaspoonful of the stuff was said to be enough. Naturally, as a distinguished Cambridge-educated academic, David ignored that miserable measure. Apparently David was keen to have the SPG involved today, as he felt that SPG involvement is likely to keep the sombre moods to a minimum. Hopefully sombre this will not be, so those of a delicate disposition may wish to avert their gaze now. I could give you my and others’ reminiscences, but fortunately David was a superb wordsmith. And when email was invented, it was as if it had been made for him personally; many, if not all of us will have had emails that conveyed his pearls of wisdom, or perhaps less elevated thoughts on the state of some aspect of society. In fact, it feels pretty normal to have David quietly in the background, and today will only be unusual in that when we get home there will be no email from him, providing comment and thoughts on the proceedings. So, I am just going to read you a tiny few of the thousands of emails from David, to try to paint a portrait of him in his own words, and help you to remember. Although I may have taken extracts, none has been edited. I think they really capture a lot of a complex and very human being. However, it served me well when CS joined Electronics in 1986. The old guard in Electronics had very little regard for us. But a few days after the merger, David Stewart approached me and asked in awed tones "are you the Barron of 'Rishbeth and Barron'? When I said yes, I was in! David told Ray Steele, and Ray then accepted me as someone worthy of respect. Of course, there was much satisfaction in getting the better of Graham Hills, then Dean of Science. (He accused me privately of eating hot chillies for breakfast.) But the real hidden agenda was that once we had a Faculty, it became much easier to promote the cause of CS. With evident results - as I said, Cambridge was a hard school of academic politics. Jim (Craggs)'s death reminds me of the "fight" to establish Mathematics as a Faculty in its own right. When Jim ended his term as HoD, it had been going on for ten years. Jim was the last of a line of Mathematics Professors who believed that reasoned argument would make the case. They got nowhere. P.S Apropos not having the argument, my modest success in academic politics was in no small part due to my learning early on that you should never start something that you know you cannot possibly win. If that's the case, then you resort to 'softlee softlee catchee monkey'. If you're pretty certain you can win you go in with guns blazing. If you're a bit doubtful you wait till the sun is low, and in the enemies' eyes. Worked well for me. Quantum Physics tells us that the act of observation can change what is being observed. I have a medical example. When an attractive lady doctor wearing a low-cut blouse leans forward to check your pulse ... you have to look away sharpish if you don't want an elevated figure. Indeed, he was very proud of what he did to help women take their just place in the largely male environment of an engineering department. The media, government and poor websites were popular targets for his criticism. BBC have just announced that advertised programmes on BBC One are abandoned until further notice so that thay can show Andy Bloody Murray's match at Wimbledon. Given that the audience share of digital BBC3 is so small as to be almost unmeasurable, why couldn't they can that instead? Surprise, surprise, the advertised schedule has been abandoned to allow Wimbledon coverage to over-run. And just when you think that at least the tennis is nearly over, you remember that next week it's bloody golf. ... but I'll say it again. What really, really, REALLY pisses me off is e-commerce sites that won't accept spaces in debit/credit card numbers. And of course he woe betide those (especially students) who presumptuously called him “David”, or heaven forfend, “Dave”. Web sites that require me to register with a me as "David". I prefer Amazon's "Hello D W Barron". I've been giving much thought as to what I should write in as my religion. Front-runner at the moment is 'Lancastrian'. The EDSAC 2 had two hardware modifier registers (or three if you include the instruction counter, which could be used as a modifier to achieve position-independent code – another of David Wheeler's inventions). Realising that this might be a limitation, David provided a capability to use any memory location as a modifier. The instruction '2 f n' added the contents of the address field of location 'n' to the address of the following instruction. '2' instructions could be cascaded, and could be modified with the hardware modifier registers, leading to a variety of ingenious tricks. But David being David, he also introduced a level of indirection with the instruction '4 f n'. This modified the address of the following instruction by the address field of the location pointed to by the address in the '4' instruction. Of course, '4' instructions could be cascaded giving multiple levels of indirection: or you could use a sequence of '2' and '4' instructions each modifying the next, and possibly themselves modified by the hardware registers. Nik, describing his Virgin cable setup, observes that the TV Catch-up Facility is very useful, but the material is copy-protected, so you can't record it. "Unless I put my little black box in the connection". P.S Apologies for the mixture of Times 10pt and Courier 12pt in the text above. Eudora has a mind of its own when it comes to fonts and sizes. Jacky has received a well deserved promotion at King Edwards. But she's not entirely happy with her new title of 'Senior House Mistress'. As she observes, it can be mis-construed, and certainly will be by some of the lads in the Sixth Form. But I reckon she will cope with them with elan. Runs in the blood. I remember years ago telling an unruly class that "you can try whatever you like, but I've seen it all before, so there's no point". (Reminds me of the time when the University's 'Teaching and Learning Committee' spent two hours deciding to call itself the 'Learning and Teaching Committee'. What's wrong with teaching? All through Grammar School and University I had an avid desire to learn. Which was served by a long sequence of inspired teachers, to whom I am eternally grateful. I understand that my Wikipedia entry (I blame Hugh: I've never looked at it) says that I had "an almost unique lecturing style". It wasn't unique at all: it was modelled on all the wonderful teachers who had inspired me in the past. And it was based on the belief that some of the audience were keen to learn, and I had the privilege of passing on the understanding of the subject that I had achieved by the sweat of my brow. And it gave me great pleasure to do so. And it worked. In my last year of delivering my third-year option on scripting languages, I got the graveyard slot at the end of Friday afternoon. Needless to say, I didn't get a large audience. But those who came were keen to learn. To the extent that several of them would come down to the lecture bench when I'd finished to raise a number of questions that proved they had really been listening. And we carried on an animated discussion until I felt obliged to point out that the bar had opened some time ago, and we were losing valuable drinking time. Chris Harris was equally supportive. In my final year I mucked in by giving the UCAS recruitment talks. (For most of the season my routine was to go to RSH at 09:30 for Radiotherapy, then get back to Zepler to perform at 11:00.) I have to say, modestly, that on a couple of occasions I got spontaneous applause from the audience, and I got lots of congratulatory comments from the parents who attended. In fact, I have a feeling that this might be a nice time to give David a round of applause. The computer is the most far-reaching of our technological innovations, and like all technology, it can be utilised for good or ill. It is too late to turn back, and bury our processors and peripherals like Prospero’s Book, but we must avoid the danger of being swept along on a tide of innovation. If computers are to be used for good, then it is essential that everyone should understand what they are, and what they can do. Equally, those of us who are behind this technological revolution must gain a greater understanding of our tools, because out of understanding comes judgement. We are only witnessing the beginning of the changes in Society that the wide-scale use of computers will bring. The changes are not going to be comfortable, but it is the job of those of us in the University to ensure, by education and research, that they are not catastrophic. That is why I am in the game. And, to be honest, it is great fun, too. In the intervening 40 years it is good to report that with his help and humanity we have not lost the game. And there has been a lot of fun as well. 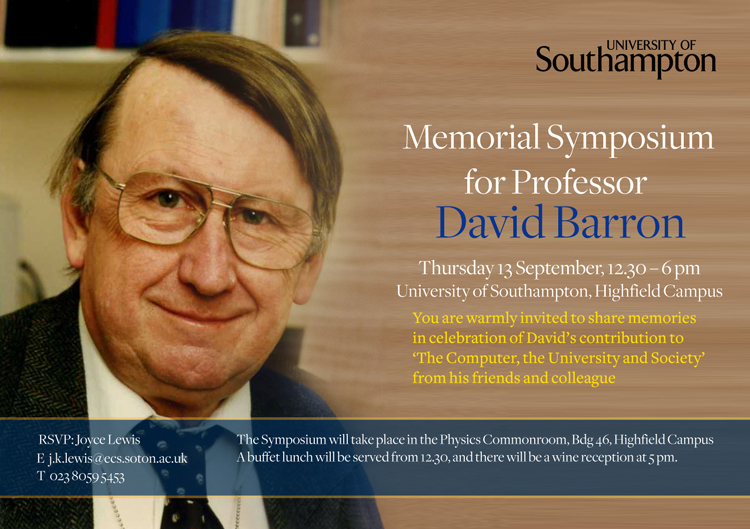 David Barron was a staunch supporter of Number Watch and there are many references to his direct contributions in the archive (see, for example, the Number of the Month for July 2001), though there were far more that are unacknowledged. He was master of his subject and was once disconcerted to be adversely criticised, during an assessment visitation by a lecturer from a former polytechnic, for lecturing without notes. Computer Science as a new university discipline could well have descended into organised charlatanry, as did some other subjects (e.g. sociology and epidemiology) but a small group of international academics kept it on the rails and turned it into a rigorous discipline. David was one of them. He was not a seeker after fame, which heightens the honour in which he is held by those who knew him and of his works. What made David influential in the combining of the world’s first electronics department (and an acknowledged world leader) with a younger computer science department was his background as a physicist. Not just any old physicist, but one who had co-authored a notable paper on the ionosphere. 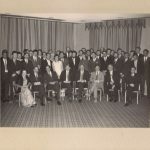 Subsequently as a head of the new department he was able to talk to the engineers and physicists on equal terms. At Cambridge he had come under the influence of Maurice Wilkes, known as the father of British computing. The realisation then developed that there was a gaping hole in the state of computer technology, which was the non-existence of a science of programming. This could have reduced the inchoate technology to chaos, which is why David became one of that elite and influential international group who saved the day. He was one of a new breed – the software engineer. He was also a man of principle and could be very stubborn if pressed to compromise those principles. For example, when that disastrous political folly known as the Research Assessment Exercise was launched, he shrugged off all pressure to join the “paper chase” and continued to produce his thoughtful books every few years. His chosen weapon, however, was the e-mail, issued copiously both locally and internationally. This was medium by which the sound academic discipline of Computer Science was established, from the time when relatively few people knew of its existence, as David’s memoir of Edsger Dijkstra demonstrates. Many of David’s e-mails have become collectors’ items, and I am devastated that I lost my personal collection of these in a recent catastrophic computer crash. They were succinct, witty and, when in attack mode, often acerbically to the point. It was typical of him that, though himself a life-long non-smoker, he fought to the bitter end to preserve a ghetto for the smokers, but this was after the going of Gordon Higginson and the tide of political correctness prevailed. Theirs was a generation for whom that much abused word “liberal” still retained the old meaning, before that definition was turned on its head. How his contribution is missed in discussion of the most recent foolish proposal to come from the political class, that schools should teach computer programming! I have been programming longer than most, over half a century, and I would not even consider teaching it as a subject, for fear of passing on my bad habits. We engineers and physicists who came under David’s guidance were reluctantly obliged to accept that the computer scientists had a point about the importance of rigour. It would be a foolish untruth to say that they do not make men like this any more, but perhaps true that they no longer rise to positions of influence. He didn’t really remember me as an undergraduate mathematics student at Southampton. He taught me computing – Fortran programming to be exact. I hated it. Not because of his teaching – he was an excellent teacher – but because I couldn’t see the point of hanging around the computing laboratory for hours to get the results of a three line programme. At the time I really loved the abstract thinking required for pure mathematics and went on to do a PhD in algebraic topology. I got to know David then as one of the professors in the maths department at Southampton. But I didn’t really socialise with the computer scientists and never dreamt the subject would come to mean so much to me. I left Southampton in 1977 looking for a career in academia but I couldn’t get a job as a pure maths lecturer. I managed to get a job lecturing in maths but it was maths for engineers and then maths for trainee teachers. During this time the first personal computers started to emerge. I was asked to set up a course to teach teachers BASIC programming. I taught myself BASIC one summer holiday and never looked back, although I was of course mentally mutilated for life as described by Dijkstra – I never really mastered the art of programming! But I got more and more interested in the use of computers in education. I took a part-time MSc at City University in computer science and applied for a job as a lecturer in computer science back at Southampton. I had little experience teaching computer science and even less research experience. I didn’t think I stood a chance at the interview panel but for some reason best known to him David decided to take a bet on me. 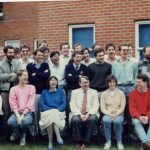 After all I had a PhD from Southampton, so I had shown I could do research – just not in computing! 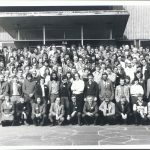 At that time the CS Group, which David lead at Southampton, had just become a Department and had taken its first intake of BSc Computer Science students. We’ve included some of the early CSD photos in this blog. It is amazing to think how small we were then. Pascal was the first teaching language in those days. We taught it to our own students and as a service course across the University. It was a baptism of fire for me but David was so incredibly supportive. 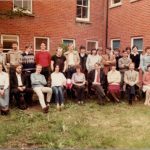 He encouraged us to use new technology in our teaching – Gillian Lovegrove and I were reminiscing at David’s funeral about the videotape programme we used to teach first year Pascal – and dictated in the mid-80’s that email would be used as the main method of communication in the Department from that point on. I remember thinking – surely we’re not going to send emails to people in the office next door – but of course David with his amazing ability to see into the future when it came to computing technology was right. We all took to it like ducks to water, as did the rest of the research community and eventually the rest of the world. I was still very interested in the use of computers in education and began exploring the possibility of using the latest interactive videodiscs for teaching programming and other subject disciplines instead of videotape. David enthusiastically encouraged me to do this and even bought me a videodisc player to experiment with. It cost about £1K, which in those days was a large chunk of the Department’s equipment budget. He also paid for me to go to multimedia conferences in the US, which I could never have funded on my own. Others in the Department were not so happy. Was this real computer science? David stood his ground. This was the future and he was encouraging me to be a pioneer. If he hadn’t done this things would have been very different. I would never have had the career I had in computer science and I might even have left the subject behind all together as the negative comments about the direction my research was taking me were very hard to deal with. The rest as they say is history. We became the first group in the UK to develop videodisc drivers for the Apple Mac. We pioneered the development of multimedia and hypermedia information management systems and we became one of the few computer science research groups to take Web research seriously. I would argue David’s hunch paid off and I think so would he. He introduced my inaugural lecture. “Watch my lips” he said. “When I first knew Wendy she was shy and retiring”. With his help I had become so much more confident. I secured an EPSRC Research Fellowship and a personal chair. David was so proud and I loved him for that. 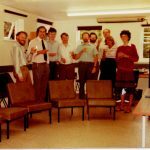 He had of course had the foresight to lead us into the merger of Electronics and Computer Science at Southampton in 1987. He became the second Head of ECS and the meteoric climb of CS at Southampton began – from a small group that did virtually no research to the world-class research group it is today. When he stepped down as Head of ECS he was a bit lost as to where he belonged. I was so pleased when he agreed to join the Multimedia research group and spend the last years of his working life associated with our research effort. At his father’s funeral, Nick talked about David’s approach to diversity. When David was asked what he was doing about women in computing at Southampton he replied “We employ them as academics”. I will be forever grateful that included me. When I met David Barron, he was wearing pink socks. His explanation was typical of his sense of humour, and of our subsequent research, which centered on taking real measurements. We investigated whether drinking Cinzano made them pinker. By the time we had enough data, though, we could not take the definitive decision, but we went home happier. 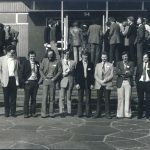 That was in January 1973, when David was part of a team of professors from the UK that IBM brought to Cape Town to “Teach the Teachers” computer science. David presented his work on comparative programming languages, explaining so simply and clearly about l-values and r-values, that by the time he got to call-by-name, he still had the large group with him. We had used David’s Assemblers and Loaders and Operating Systems books in my undergraduate classes, so he was already famous, but his work on languages was a revelation. David called this kind of work “Software Engineering”, and in true engineering style, we started by building something – a Pascal compiler for the 2970. Our first attempt was to retarget the existing first compiler for the CDC 6600, which had already been done for an ICL 1907. This required getting 9” inch magnetic tapes posted from Zurich, and a trip to Belfast. Then because David and I discovered that we were kindred spirits in loving parties, we organized the very first Pascal symposium (Latin for drinking party) was held at Southampton in March 1977 in the Maths Block and featured such notables as Per Brinch Hansen, Brian Wichmann, and the originator of the Pascal Newsletter, Andy Mickel. For several years, the Newsletter was printed and shipped from Southampton. David was never scared of taking a new road. In 1975, he decided to introduce Pascal as the language for second year teaching – even though we only had our somewhat rickety compiler. With a course that he put together over the vacation, and with interesting examples for the students to try, the course was an academic success, and led to a book that we wrote jointly on “Advanced Programming”. 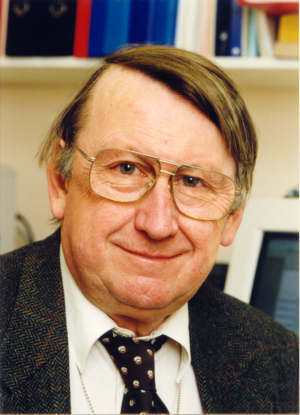 Morley Sage, then the Director of the Computer Centre, was not so happy, as the compiler used many more machine cycles than WATFOR, but David was determined that students would not continue to be subjected to what Dijkstra has labeled as an “infantile disorder”. I admired David immensely – for his vision, his clear thinking, his humanity, and his prodigious output of books. I am very proud that he was my PhD supervisor – I was his second graduate – and that when I returned to Southampton as a Reader in 1988, I could call him a friend. I offer my sincere condolences to Nik and Jacky who have lost a dear father. I know that when we all wear bright ties on Friday, David will smile, and know that he made his mark in his own way. Editors note; I’ve been sent this photograph without a caption. Can anybody shed light on the context! ?